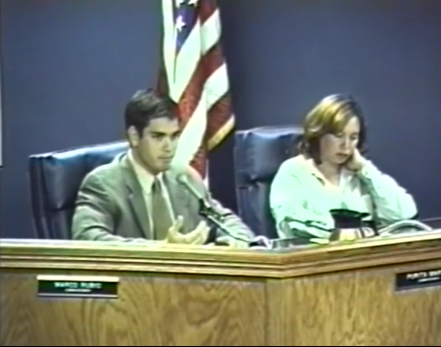 Before Marco Rubio was debating Pacific trade deals or normalizing relations with Cuba in the U.S. Senate, he was arguing car wash rules and which trees to plant on the West Miami City Commission. Tonight in Ohio, he'll debate nine other Republicans running for president. But Washington Post reporter -- and Miami Herald alum -- Robert Samuels thought it would be interesting to look at Rubio's time representing the town of about 6,000. It was a time when an awkward sip of water wouldn’t go viral, as it did when Rubio delivered a nationally televised speech years later. In relative obscurity, he experimented with the occasional issue, such as how much residents should have to pay for government services, that would begin to define his ideology. He showed flashes of a thin skin. But, for the most part, he looked bored. On the night in July 1998 that he pleaded with the commission to do something — anything — the group had been engaged in a long discussion about how to handle public hearings on the city budget. Rubio stared straight ahead — stonefaced. You can read Samuels' full story here, and watch some highlights of Rubio's city commission meetings published by the Washington Post. Copyright 2015 WLRN-FM. To see more, visit http://wlrn.org/.